Phone systems have certainly gotten more complex over the years. Gone are the days where we were just concerned about being able to make and receive a call. Now, when we engage in looking for a new solution, in addition to types of phones and features, we hear complex talk about VOIP, QOS, Convergence, Integration, Hosting, and more. 1. To VoIP or not to VoIP? VoIP stands for Voice over IP. That clears things up doesn’t it? It really means combining your phones onto your computer network. Sounds simple, but not really. Many vendors insist VoIP is an automatic, if you are getting a new phone system. However, it really depends on your business. You will want to consider VoIP if you need any of these features: the ability to connect remote offices on the same phone system with extensions that appear local, toll savings if you are frequently calling these offices or surrounding areas, certain integration features like the ability to send voicemail to your email inbox, or the ability to integrate and automatically forward to cell phones based on whether your cell is in the building. One thing to keep in mind is that many systems offer a hybrid of VoIP and traditional phones. With these systems, you can connect most of your phones via the old copper wire connections, and have a few that connect via VoIP. You can also have some of the features of VoIP like integration with email and web based programming, without putting the full stress of VoIP on your network. And, by putting less phone traffic on your network, you can avoid bandwidth and performance issues. 2. Hosted or Local? Do you want to have the central phone switch (that box where all the lines converge) in your office, or do you want to have it hosted in the Cloud using a shared service? The practical difference often ends up being just a few things. With Hosted everything is bundled through the provider, including your phone line service. 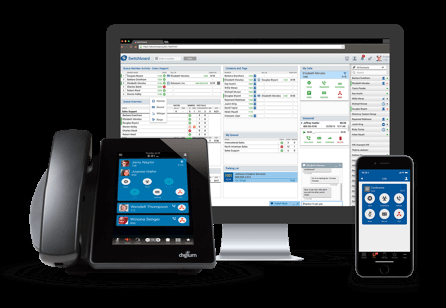 All of your phones communicate directly to the hosted phone controller unit over the web. You get a rich set of services without investing in your own equipment, and if you have multiple locations, they are not dependent on the main location connection to the Internet. You get flexibility, lower up front cost, and an all-in-one solution. The downside is that the monthly fee may end up higher after a year or two, and it significantly increases your Internet reliance. Local keeps things simple, and is still the right choice in many cases for single location businesses. It can offer most of the same features as hosted. However, it often requires an up-front purchase or longer term monthly commitment and a replacement schedule of around every 7-10 years. 3. Provisioning Lines. This is where things get a little blurry. Often people combine terms when discussing provisioning, because there is some overlap. Provisioning is simply how you get your phone line service. The traditional method is through Telco lines that run directly into your building. This could be PRI, analog (POTS), or some other directly wired connection. The newer method is really a VoIP provisioning or hosted provisioning of lines. This means you get your lines via the Internet in some fashion. With a hosted solution as discussed in the previous point, your lines will be provided via the hosting company, so provisioning is not a decision you have to worry about. If you keep your phone system local, then you have to choose either traditional phone line through a vendor like AT&T, TDS, or another Telco; or a VoIP provisioned line through a wide variety of other vendors. VoIP provisioning is usually selected for either cost savings or for advantages in connecting multiple sites. 4. Preparing your network for VoIP. If VoIP makes sense for your organization, I recommend involving your IT department early. You are marrying your data network with your phone network, so there are many important considerations. Is there enough bandwidth? Should we use separate physical networks, or should we use a virtual separation called VLAN? Do we need power over Ethernet or PoE so that the phones are powered by the Ethernet cable? Will the switches and equipment support QoS or Quality of Service and allow us to control what gets priority, voice or data? Are there cables that need to be run? Are the right tools in place to allow for integration of voicemail and email? Be careful not to gloss over integrating the data and the phone network. In most cases, there are infrastructure changes and upgrades that need to happen. 5. Bandwidth, Bandwidth, Bandwidth. If you choose a VoIP system, the number one problem we see is dropped connections and garbled conversations. Almost always, the problems involves bandwidth and making sure the phones get enough of it. Sometimes this is solved by having the right switches and routers with the proper configuration. Sometimes it is just insuring that you have enough bandwidth over the Internet between locations. It is important to carefully plan out the both equipment and bandwidth requirements, particularly for a multi-location VoIP phone system. In today’s technology centric world, the phone decision has definitely become more complex. Making the right decision is a blend of understanding the technology concepts, assessing your organization’s needs, and understanding the impact on your network and existing technology infrastructure.